Can too much parental control lead to behavioral issues in kids? According to recent studies, it can, and it does. A study from the University of Minnesota reveals that “helicopter parenting” has a negative impact on a child’s emotional well-being. In addition, it can also make children less able to control their natural impulses, which, in turn, impacts their coping and social skills. The study, which was published in the journal Development Psychology by the American Psychological Association, examined 422 children and their parents over the course of eight years in both the U.S. and Switzerland. According to the study, children who learn to handle challenges and everyday situations by themselves, without interference from parents, have a better chance of success in their later lives. According to psychologists, helicopter parenting can start to manifest itself in toddler-hood. A helicopter parent typically doesn’t give a child enough “alone time” during play; but instead will constantly shadow the child, directing everything the child says and does. 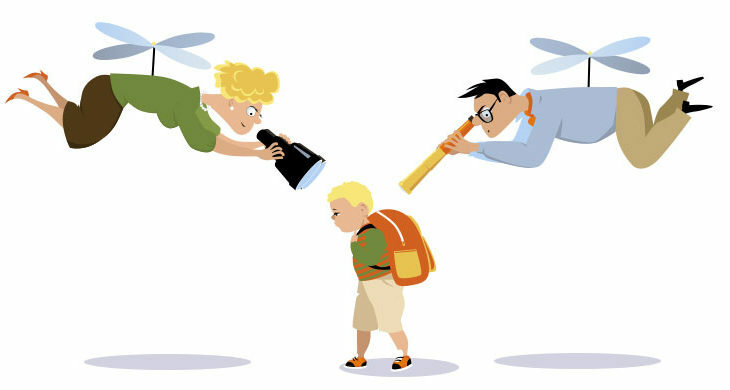 On the first day of school, helicopter parents start off by going to the school to ensure that their child has a certain teacher, and then continue to “overparent” by selecting friends and activities for their child, rather than allowing the child to select his or her own. These parents might also provide too much help with homework or in school projects, rather than allowing the child to fully contribute to the schoolwork. As the years progress, these parents might continually call teachers about low grades, control a student’s curriculum or class schedule, or show up at and monitor every extracurricular activity from piano lessons and drama rehearsals to sports practice. According to the University of Minnesota study’s lead author, Nicole B. Perry, PhD, children of helicopter parents are less capable of dealing with the challenging demands of growing up and “navigating the complex school environment.” Instead, these kids tend to act out their frustrations in the classroom, as well as have a hard time socializing and learning on their own. The study involved a number of experiments that tested children’s emotional control, social skills, and decision-making abilities. Those who had been taught to think for themselves and act more independently coped better during challenges, socialized better, showed more empathy and understanding by sharing more, and demonstrated better control over their emotions. 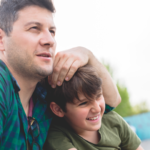 Educators and psychologists agree: Even though it’s often done with the best intentions, helicopter parenting is not the way to teach your children self-control. According to Dr. Perry, parents can help their children cope with challenges and learn self-control by talking to them and helping them understand the feelings that prompt their behaviors. One example would be to explain to children why we feel the way we do when certain things happen— such as feeling frustrated at not being able to solve a math problem, or feeling grumpy when we’re overtired or stressed. For parents, it all comes down to being able to recognize the difference between engaged parenting and helicopter parenting. 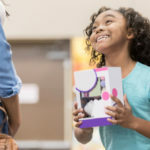 “Failure and challenges teach kids new skills,” explains Deborah Gilboa, MD, and founder of AskDoctorG.com, “and, most important, teach kids that they can handle failure and challenges.” taking a step back and allowing kids to solve their own problems will ultimately give them the reliance and self-confidence that they need. Family Living How Many Kids Cause Moms the Most Stress?